Rayvon Owen advances to American Idol top 24! Performing at LA’s House of Blues, Rayvon secured a spot in the top 24 contestants on American Idol! CFA Visual Arts Rocks the 2015 Scholastic Awards! 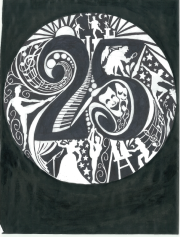 Congratulations to CFA Visual Arts student Joseph for submitting the winning design for the Center for the Arts 25th Anniversary T-Shirt!